Can I Use Gantt Charts to Track Project Milestones & Tasks? What is a Project Gantt Chart? Project Gantt chart provides the details about milestones, tasks, dependencies and sub-projects involved in a project. This project gantt chart will be enabled only if the project has task(s). It serves as a focal point throughout the project improved resource scheduling and better understanding of task dependencies and identifying critical path through a project. So accurate duration of tasks can be identified since it has been used as the reference for tracking hours for the project and easy to identify the task duration at time of invoicing. How do I view Gantt chart of my Project Tasks? In order to have an easy view of project’s tasks, Projects App allows you to view project gantt chart on the project overview page. The project can have one or more milestones, and these milestones can have any number of tasks. There are two columns; milestone and task. Each row of the milestone displays name of the milestone and each row of the task describes each task with the task durations. This also helps you to identify easily whether the project is tasked. Choose the project for which you want to view the gantt chart. 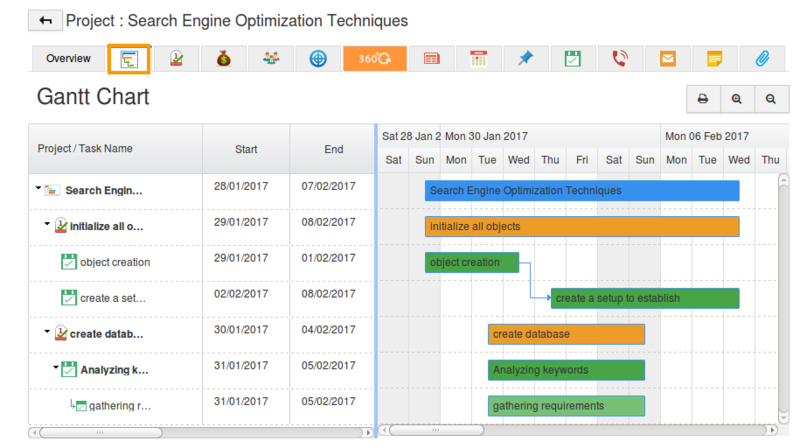 Click on "Gantt Chart" icon to view the chart. Is there a possibility to view more than one milestone in a Gantt chart? Yes, you can take a look of more than one project milestone in the gantt chart. There is a row wise display of milestones, where you can view each milestone. The milestone will be high lighted in orange color, tasks and sub tasks duration will be in green and light green color, dependent tasks are shown with an arrow for the better reference as shown in the below image. The task name will be displayed when you mouse over on the highlighted (Green color) region. You can print the Gantt chart using "Print" icon and also zoom in or zoom out.